Join us for an incredible Uluru Sunset Experience that you won't forget. We'll pick you up from your hotel and journey by bus to Uluru. Upon arrival at Uluru you guide will lead you into the famous Mutitjulu waterhole, where you can marvel at ancient Aboriginal Rock Art. After this we'll teach you how to Segway and set off and cruise a quarter of Uluru's massive base. After a cruise your guide will lead you on foot to visit the ancient caves of the Mala Walk. As the afternoon comes to a close we'll set up a sunset picnic for you, with nibbles and soft drinks. Let us pick you up from your hotel within Ayers Rock Resort, approximately 4 hours before Sunset, and begin our afternoon of adventure. Our first stop is at the Mutitjulu waterhole where you guide will lead you to view ancient Aboriginal Rock art and marvel at Uluru's beauty. After this it's time to learn how to Segway, we'll provide you with all the safety equipment you need and give you some time to practice in our purpose built training course. 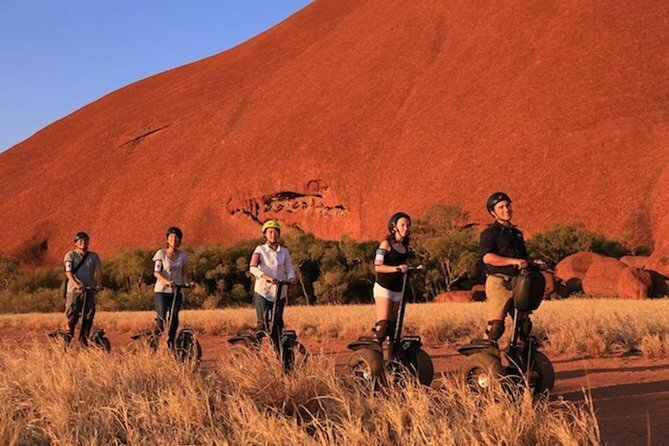 Once you are comfortable on your Segway it's time to follow your guide and Segway the most scenic section of Uluru's impressive base. After Segwaying around one quarter of the base of this massive rock, it's time to explore on foot. This time we'll visit some of the unique and interesting caves on the Mala Walk. Whilst here, your guide can explain to you about the environment and Anangu (local Aboriginal) culture. As the sun drops lower on the horizon we'll set up a sunset picnic of nibbles and softdrinks. You'll enjoy an intimate sunset right at the base of Uluru, take some amazing photos before heading back to your hotel for the evening. • Please bring 1L of water and closed in shoes. be free from serious vision/balance impairments, illness or injury that may impact your ability to Segway. This activity is not suitable for pregnant women or people with a history of serious spinal injury.